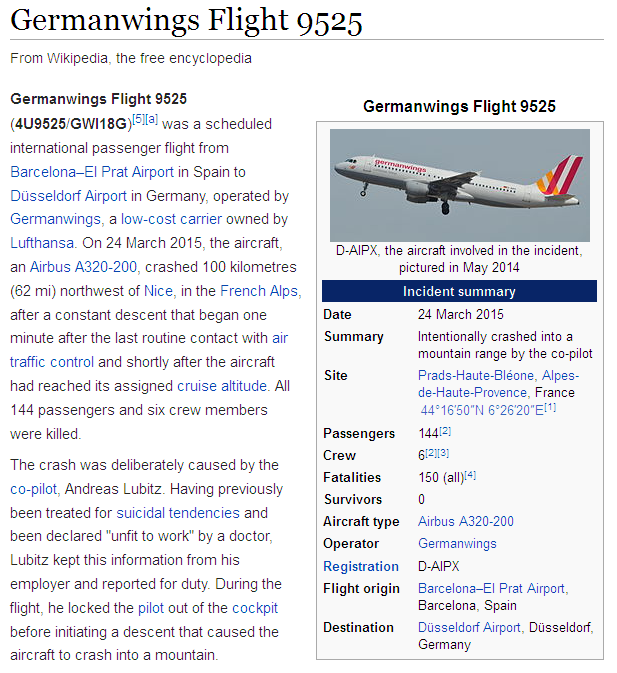 Background description of the incident, retrieved from Wikipedia (September 26, 2015). Andreas Lubitz (18 December 1987– 24 March 2015) was the co-pilot of Germanwings Flight 9525, which crashed into the French Alps on 24 March 2015 killing him along with 149 others. French and German prosecutors investigating the crash have confirmed that Lubitz had been treated for suicidal tendencies and believe that he intentionally crashed the plane. 1. Tian-Liang, Lu-Cun, Tian-Xi & Tian-Xing at the Life Self Palace: the common character of Tian-Liang, Lu-Cun and Tian-Xing is lonely. 2. Life Hua-Quan and Life Hua-Ji opposite to each other ---- the “Quan-Ji” inborn Si-Hua combination: it means changed suddenly and just cannot help for these changes. 3. Life Hua-Quan with Self Hua-Ji at the Life Career Palace: a bad sign for Life Career Palace from general point of view. 4. Life Spouse Palace flying Hua-Ji into Life Travel Palace with Hua-Lu to opposite. In here, Flying Ji with Hua-Lu to opposite became “double Ji” clash Life Self-Palace. It’s also a very bad luck sign for marriage related issues. 5. Decade (22-31) Spouse flying Hua-Quan into Life Children with Self Hua-Ji over there which became “Quan-Ji” clashed Life Property. It called “Spouse-Property Exchange” --- which is the sign of separation in life or parting at death in this decade. 6. For suicide, something must be wrong for Health/Friends/Happiness Palaces. “Decade Health Palace” Wen-Chang Hua-Ji to opposite: Wen-Chang is related with Nervous system, and Nervous system is related with depression. Decade Friends Palace “Self Hua-Ji + Hua-Quan to opposite = Quan-Ji” --- matched with inborn Si-Hua combination which means the bad sign would become a reality. “Life Happiness Palace” Hua-Quan/Ji to opposite: the bad sign for Happiness Palace and it would also become the reality. “Decade Happiness Palace”: “Flying Hua-Quan to Life Wealth + Hua-Lu/Ke at the Life Wealth = Lu/Quan/Ke shines Life Happiness” which is a good sign, but when they meet the “Hua-Quan/Ji to the opposite” at the Life Happiness, the “shine” became “clash” which become a bad sign for Decade Happiness. So there is the depression problem for Andreas Lubitz in this decade, and now we will go to find out if this problem would cause the death. 7. Death sign for ZWDS is the “Hua-Ji exchange” of Friends/Health/Property palaces. Decade Health (Life Friends) Palace: Hua-Ji to opposite. Decade Friends (Life Property) Palace: Self Hua-Ji with Hua-Quan to opposite. Decade Friends Palace Fly Hua-Lu into Life Friends with Hua-Ji to opposite at the Life Friends. Also: Decade (22-31) Self Palace flying Hua-Ji to Life Travel with Hua-Lu to opposite –which became double Hua-Ji clash to Life Self Palace. So this decade (22-31) is very bad for him and there is the sign of death. 8. The Heavenly Stems combination of Decade (22-31) Self and Travel Palace is Jia-Geng. Jia-Geng is one of the signs of the travel accident. Loneliness/Depression, Nervous system, Death sign, the worst decade of life, sign of the travel accident. This ZWDS plotting technique will be covered by Master Tony in the Foundation Course in Zi Wei Dou Shu (ZWDS) / 紫微斗数 / Purple Star Astrology. View course detail here. This ZWDS chart is plotted by using version 2.1 Flying Star Zi Wei Dou Shu Calculator also by Master Tony. Click here to download this free software. More trade secret has been reserved for Advanced and Master level courses.